May 3, 1900: On last Thursday night, Dr. John Choate died of la grippe, heart trouble, and urema. He was 64 years old, a doctor for more than 25 years, married twice, last wife dying a few years ago. He leaves behind 4 boys, 2 girls. Oldest boy Caleb is married and lives in Monroe. (1900 census where Caleb is The girls will live with mother's sister, the wife of John Story near Chanute. Isaac and Silas are of age and will take care of themselves. The little boy (referring to Rufus) will live with Caleb. Dr. John Choate died on 26 April 1900 and is buried in Franklin Cemetery, Fentress County, Tennessee. 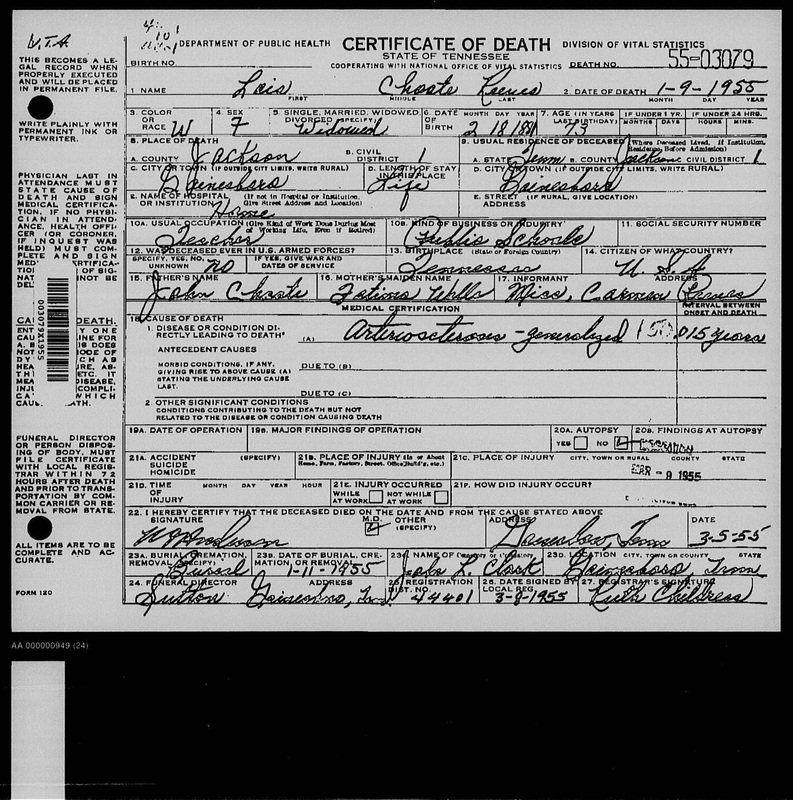 *Notes about obituary - 4 boys are: Caleb, Isaac, Silas and Rufus; 2 girls are Lois and Anna. The obituary on 3 May 1900 states that Caleb was married and living in Monroe. The 1900 Census taken on 11 June 1900 shows Caleb living in Overton County with wife Lee Vernie Norrod. No mention of Rufus. However, Lois, Anna and Rufus were located in the 1900 Census for Monroe, Pickett County, Tennessee living with Clarinda Fatima Well's sister Irene and her husband John Story. 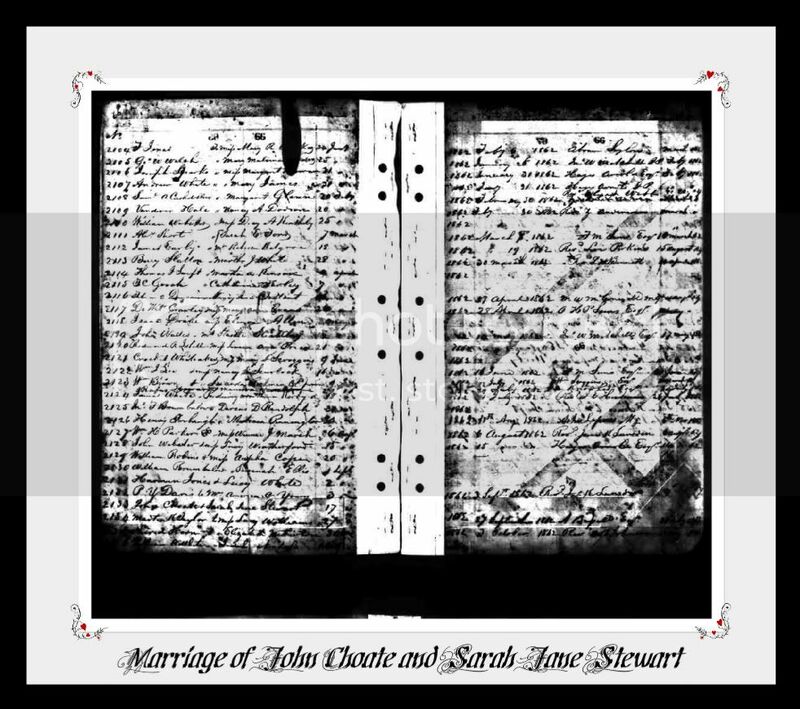 Wife #1 - * Sarah Jane STEWART was born 17 November 1821. Sarah and John had three children. 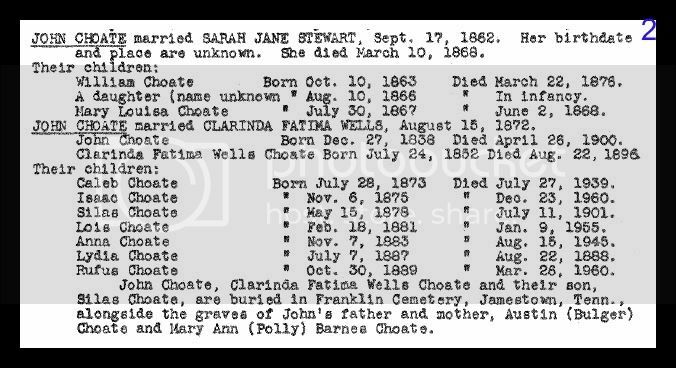 On 10 March 1868 Sarah Jane Stewart Choate died and is buried in Franklin Cemetery, Fentress County, Tennessee. William Choate was born 10 October 1863 in Fentress County, Tennessee and died on 22 Mar 1876 in Tennessee. This William shows up on the 1870 census with Austin Bulger Choate (not his father). Mary Louisa Choate was born in 1867 and passed away in 1868. 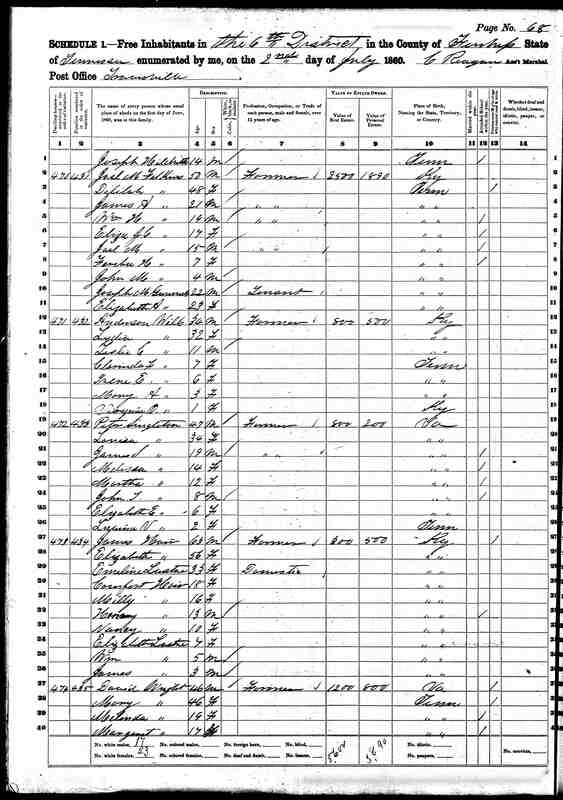 The 1900 census shows Lois, Anna and Rufus living with their Aunt Irene Story. (Clarinda's younger sister) after the death of their father in 1900. 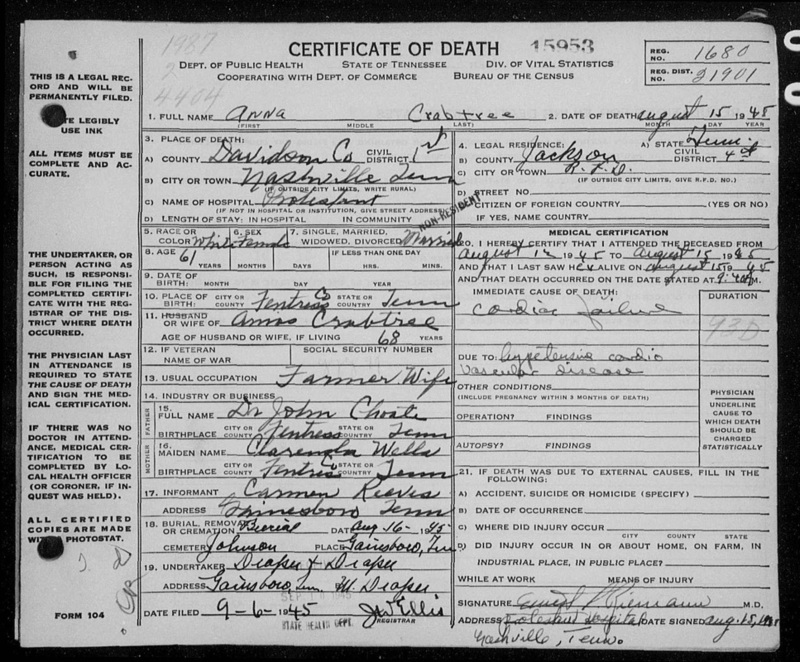 Wife #2 - * Clarinda Fatima WELLS was born 24 July 1852 in Wells Bottom, Clinton County, Kentucky. She is the daughter of Anderson Wells and Lydia Story. Clarinda died 22 August 1896 in Fentress County, Tennessee and is buried in Franklin Cemetery, Fentress County, Tennessee. Caleb CHOATE was born 28 July 1873 in Oklahoma City, Oklahoma. He married Lee Vernie Norrod around 1899. 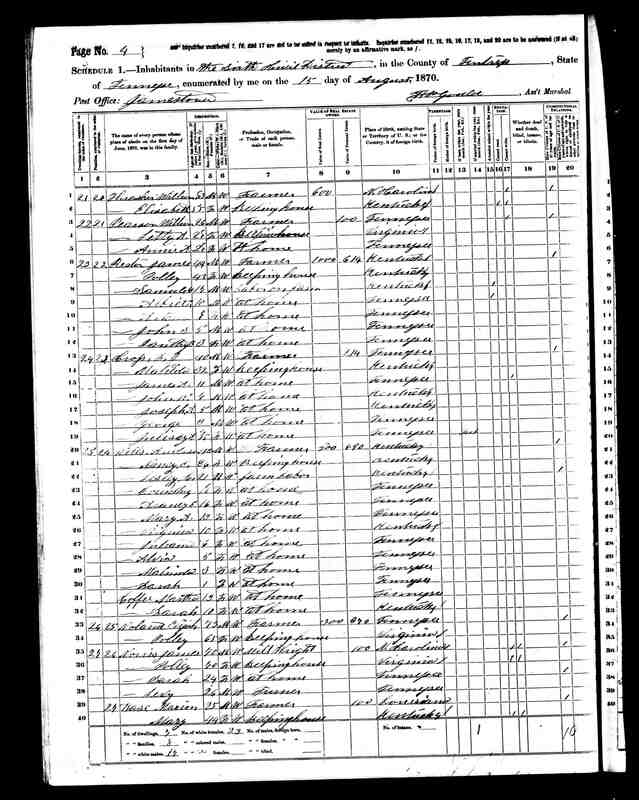 1900 Census indicates that he is a teacher in Overton County, Tennessee and had been teaching for 4 years. The 1910 Census shows that he is now a lawyer and that he was working "on his own account." It also states that he is living on Monroe Street in Beckham, Oklahoma. On 12 September 1918 Caleb registers for WWI. In the 1920 Census, Caleb and his family have moved into Oklahoma City, where Caleb is an Attorney in General Practice. The 1930 Census shows that Caleb is still practicing law at his own practice. On 27 Jul 1939, Caleb passed away. Caleb is buried at Fairlawn Cemetery in Elk City, Oklahoma. (Sometimes referred to as Elk City Cemetery, along with his wife and son Livius. Lee Vernie is buried at Fairlawn Cemetery in Elk City, Oklahoma. * Isaac Choate, born 6 November 1875 in California. He married Myrtle May Williams in 1910. 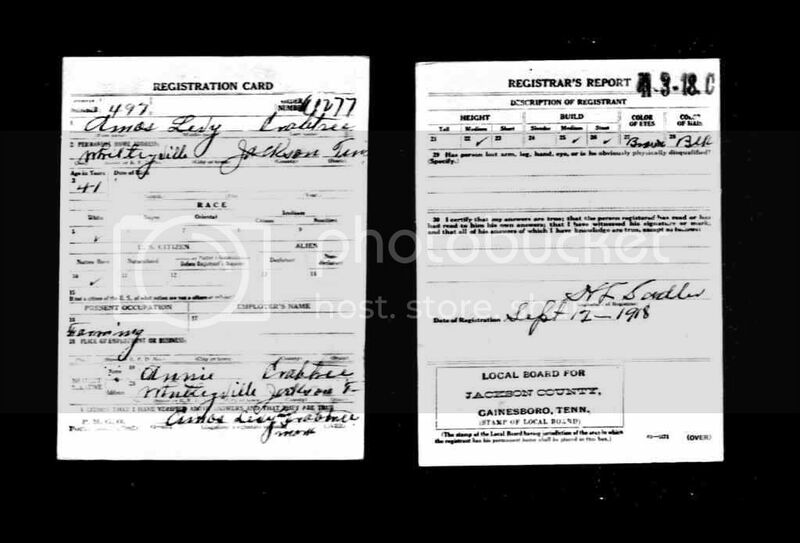 In 1918 Isaac registered for the WWI Draft. In 1920, Isaac, his wife Myrtle and daughter Irene are living in Oklahoma City, Oklahoma. He is working as a Cement Laborer. In the 1930 Census, he has moved to Norman, Oklahoma and is working as a Machinist. Isaac passed away 23 December 1960 and is buried in Inglewood Park Cemetery, Inglewood, Los Angeles County, California. Died 29 July 1967 and is buried in Inglewood Park Cemetery, Inglewood, Los Angeles County, California. * Silas Choate was born on 15 May 1878. 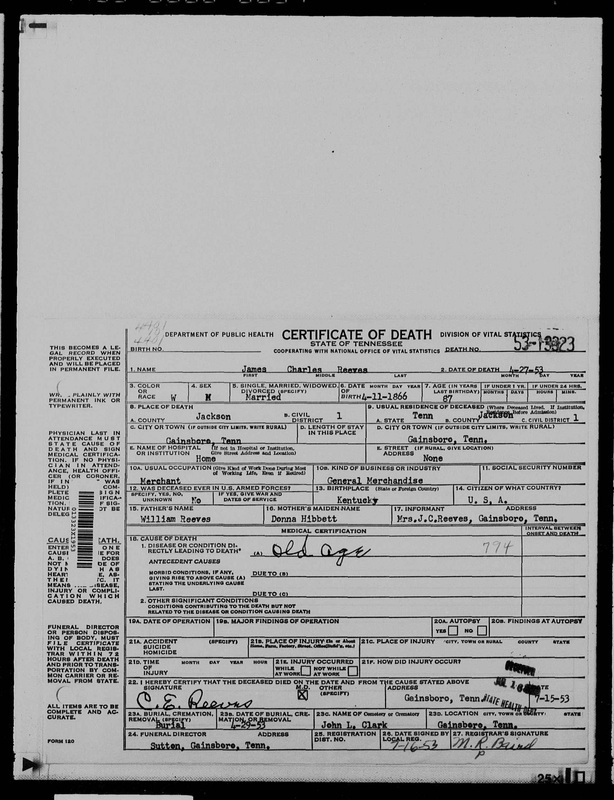 In 1900 his father died, and on his fathers obituary it says that Isaac and Silas are "of age" and will take care of themselves. At the young age of 23, Silas died on 11 Jul 1901 and is buried in Franklin Cemetery, Fentress County, Tennessee. What happened to Silas? How did he die? Lois CHOATE, was born 18 February 1881 in Gainesboro, Jackson, Tennessee. Both of her parents had passed away by the 1900 Census. After her father passes away in 1900 she goes to live with her Aunt Irene Story, who is her mother's sister in Pickett County. She shows up on the 1910 Census with her husband and her sister Anna lives with her. Gainesville, Jackson County, Tennessee is where we find her on the 1920 Census. In the 1930 Census, she shows up living with her husband and children and that she herself is employed as a Teacher in a Public School. 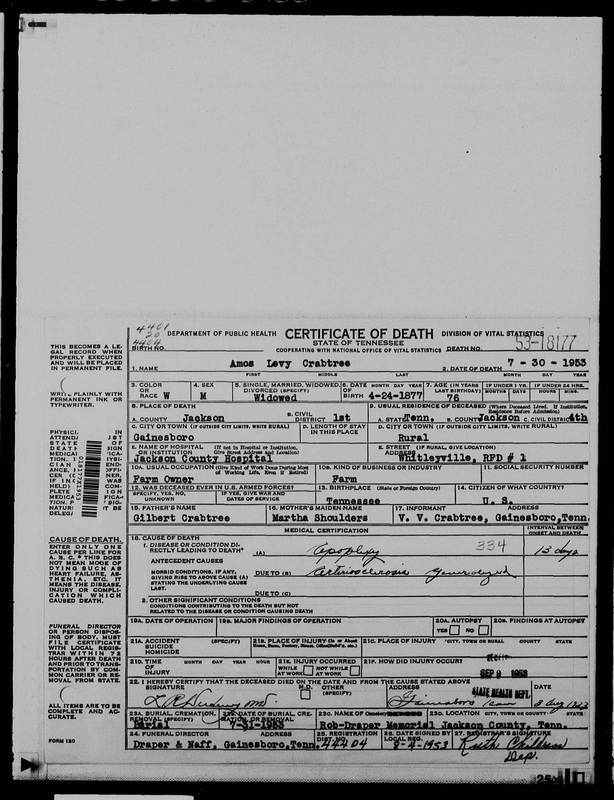 She died on 9 January 1955 of Arteriosclerosis and is buried in John L. Clark Memorial Cemetery in Stone, Jackson County, Tennessee. James was a bookkeeper and he is the son of William Joseph Reeves and Donna Martha Hibbitt. Anna CHOATE, was born on 7 November 1883 in North Springs, Jackson County, Tennessee. In 1900 she is living with her Aunt Irene Story, who is her mothers sister. She married Amos Levi Crabtree on 27 Dec 1911 in Jackson County, Tennessee. Amos had been married before and she died in 1910 and had four children. In 1910 Anna is living with her sister Lois. By 1920 she is living in Jackson County with her husband and four children as well as two of Amos's children. In 1930 she is still living in Jackson County with her family. Anna died on 15 August 1945 in Protestant Hospital in Nashville, Tennessee. She was buried in Johnson Cemetery in Gainesboro, Tennessee on 16 Aug 1945. Robert D. Crabtree born in 1924 and died in 1976. Amos was married previously and had four children with this first wife Roxie Elizabeth who died in 1910. Lydia CHOATE, born on 7 July 1887 and passed away just over a year later on 22 August 1888. Where she is buried is unknown. Rufus CHOATE was born in Byrdstown, Pickett County, Tennessee on 30 October 1889. After his father dies, he moves in with his Aunt Irene Story, who is his mothers sister, over in Pickett County. He is shown on the 1900 census living with John and Irene Story. Rufus is found in Grayson Texas on the 1910 Census working as a hired hand. June 5, 1917 Rufus registered for the WWI draft. He married Hettie Murphy. At age 70, on 26 Mar 1960, Rufus passed away and is buried in Albany Cemetery, Albany, Clinton County, Tennessee. Born 29 November 1897 in Kentucky. Daughter of Juble C. Murphy and Eura Murphy.